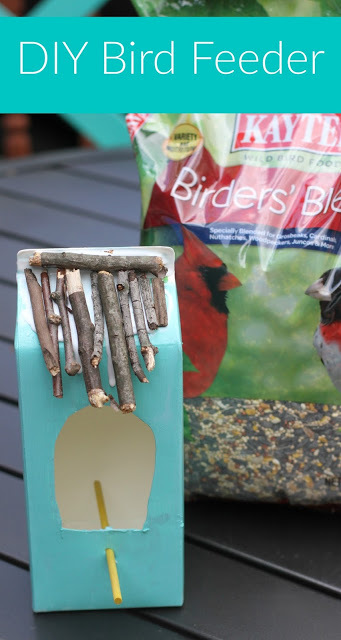 Here are some fun ways to make your own bird houses and bird bath! Spring is in full swing and we couldn’t be happier to be back outdoors. The kids have been spending hours a day in the yard and loving every minute. This is our first spring in our new house and it’s fun to watch flowers and trees bloom that we didn’t even know we had. It’s also been a lot of fun discovering something special about our yard: the birds. My kids are huge animal lovers and seeing blue birds, robins and cardinals in our yard has been such a treat. It’s made the girls really interested in learning about different birds and they hope to see more throughout the spring and summer. We’ve gotten books out of the library to try and figure out what some of the other birds we’ve seen are. All of a sudden I have quite the little bird watchers on my hands. Can you spot the Blue Jay in the photo above? The girls realized we have lots of birds flying by and no bird houses or food. 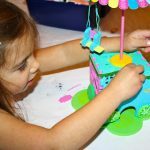 We decided to make our own birdhouses this spring. When we went to our local Ace Hardware to get supplies and bird seed, we saw birdbaths too. 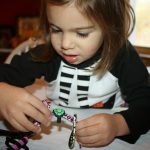 We decided to try and make one on our own and grabbed some supplies to do that too. 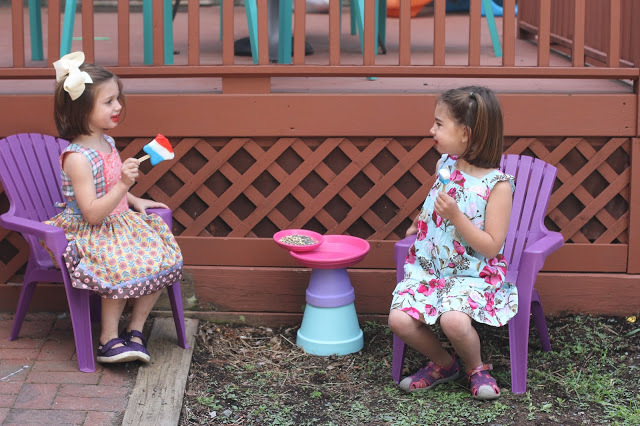 Last, we decided to get some fun chairs for the kids to relax in to watch for birds. 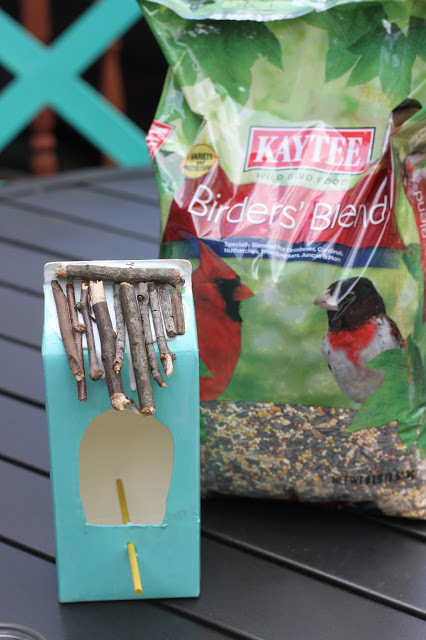 It was fun collecting our DIY supplies and looking at all of the birding supplies at our neighborhood Ace Hardware store. There were many types of seed to choose from and the friendly Ace associate helped us decide which was best for our yard. Last we found hardware and chains to hang our bird feeders once they were done. Ace had everything we needed. We went home and got to work. 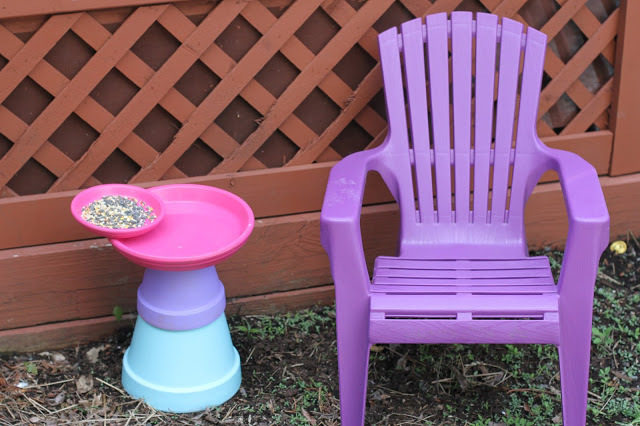 Here’s how we made our DIY bird feeders and birdbath. Clean out an empty milk carton. Cut out an opening. Paint the house. Use sticks, rocks or anything else you’d like to decorate it. Cut a small hole under the opening to put in the perch. 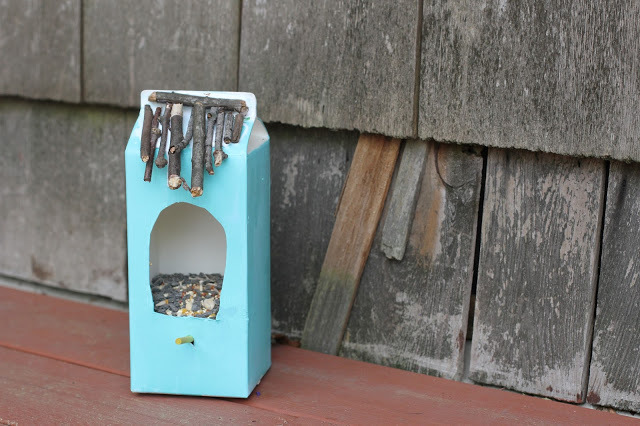 Fill the bottom with bird seed and use the chain to hang it. Now watch for birds! 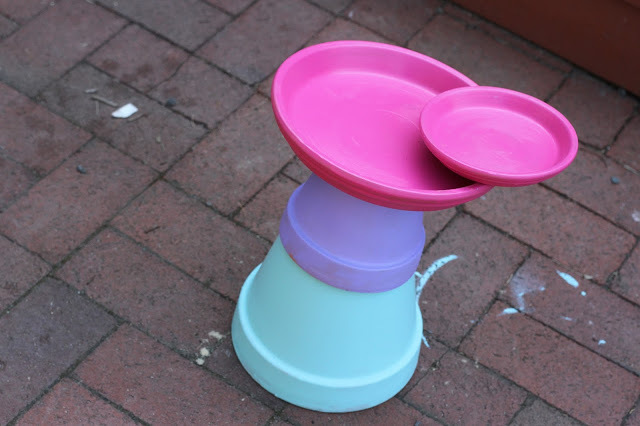 Directions: Paint the clay pots and saucers. Let dry. Stack them in place, adding super glue to hold. Once everything is dry, add water! Now for the giveaway! One lucky winner will receive a $150 Ace Hardware gift card. Please enter using the Rafflecopter form below. Good luck! Disclosure: This is a sponsored post. Ace Hardware provided products used in the post in addition to compensation. As always, all opinions are my own. Opinions and positions expressed here do not necessarily reflect those of Ace Hardware. 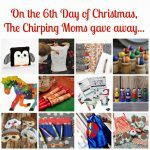 The 12 Days of Toys: 12 Fun & Unique Toy Finds Prize Collection! So cute! Would love to pick up those clay pots and saucers for the bird bath for sure! And loving those paint colors! I would get some paint for an art project I'm working on. I would probably buy lawn care items, like fertilizer and seed. After this winter my lawn needs some TLC. I would get landscaping lights for around my house. 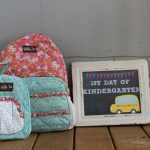 I would love to get Amy Howard's chalk paint from Ace Hardware and the other supplies you need to refinish a couple of pieces! I'd buy a raised bed for my garden. I'll buy flowers and shrubs. 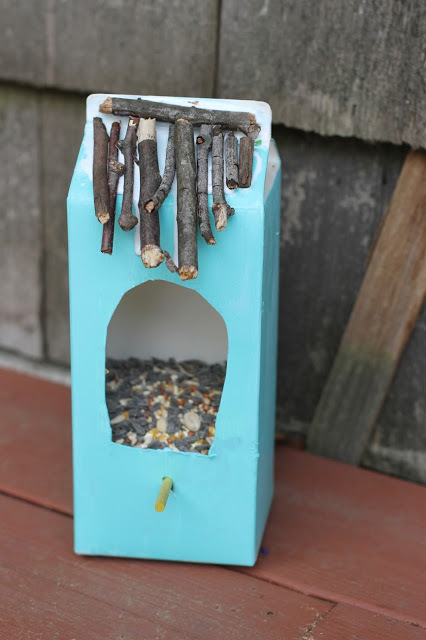 I would get paint and a new bird feeder! I'd love to buy a squirrel-proof bird feeder and some new gardening gloves. I would get some nice pots for my patio and new hummingbird feeders. If I won I'd use it towards patio furniture! I would get some pretty outdoor plants with new plant pots and potting soil to spruce up my front yard! I would buy rocking chairs for my porch. I would buy a new bird feeder and some bird feed for my rock garden. 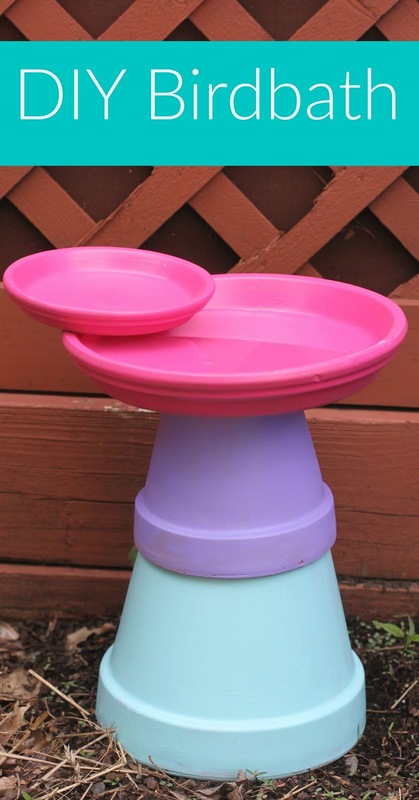 Oh we love feeding the birds…I love your birdhouse and birdbath! How fun! We have to try those! I would buy some whiteboard paint, I want to try to paint a whiteboard to hang on our fence outside for the kids to draw with this summer. Would also get some grass seed for our bare spots. I would purchase some items to help make our backyard a place where people would want to gather. I would buy flower pots! I would use this to buy an extension ladder if I won. I would get some outdoor tools like rakes and shovels. I will get Living Accents Outdoor Steel Bench. I would buy new solar lights for outside. First I would buy a mega bag of black sunflower seeds. Id get some gardening tools and put the rest toward a power washer! I would buy some more mulch and plants for the yard! I would buy some lawn ornaments for my yeard along with designer rock and mulch to help dress up the from of my yard. 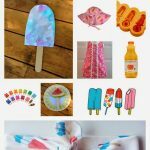 I would purchase some paint for a summer project we're doing in the spare bedroom! I would get some flowers to plant and some out door chairs. 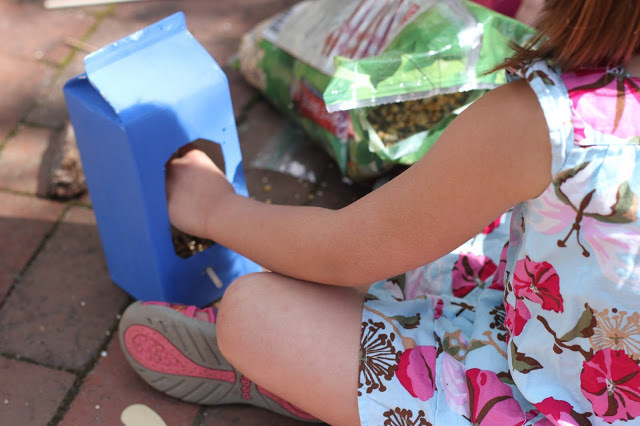 I actually need a new bird feeder because my kids broke mine when they kicked a ball into it. I'd also use it to get a bench to sit outside on my patio. I am SO into gardening this year! I have created several square foot garden plots, and even started all of my plants from seeds! This gift card would come in so handy because I am constantly expanding my garden, and needing items to maintain what I am growing. Thanks so much for the giveaway!!! I would buy things for my garden. I would get a much needed Bissell 10 Amp Cleanview Plus Bagless Vacuum! I also would get Aquacheck Complete Pool And Spa Test Kit and Ace Professional Deep Leaf Rake.